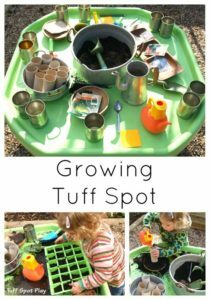 A Tuff Tray, also known as a Tuff Spot, may not look like much at first glance, but the more we got playing with it, the more it became apparent just how brilliant it is for the kids - largely because of its almost endless number of activities! In this extended guide we look at the Tuff Tray in more detail, when the right time is to start thinking of one, its key benefits, and a selection of the very best Tuff Tray ideas for you to get going. 1. What is a Tuff Tray? 2. When is my child ready for a Tuff Tray? It is a large heavy duty plastic tray. 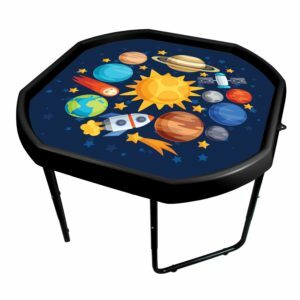 The tray itself is octagonal shaped with raised sides that are perfect for containing different materials for all kinds of messy play. It is approximately 1 meter in diameter. They can usually be found outside but are also fantastic for in-home use. Fortunately, in most places you don't have to worry about getting 3 separate packages and can get them all in one. Toddler age, minimum. 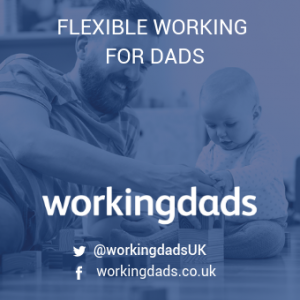 Typically when your child is at least 2 years + where both their gross and fine motor development is at a stage where they can see, touch, play to have control over the Tuff Tray activities. Basic 2-way communication. So they can listen, learn and adapt to the variety of things going on in their Tuff Trays at any given time. The imaginations are starting to rocket. 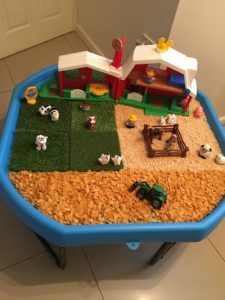 Around that early toddler age through to primary school you'll really start to notice their imaginations soar, and that is a perfect time to introduce a Tuff Tray to help them develop further. 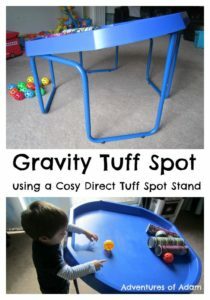 Helps encourage messy, active, play - while also containing all the mess! 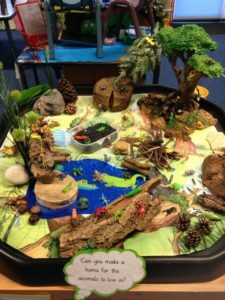 Really does help develop the imaginations through making up various 'worlds' (as you'll see in some of the ideas below). Promotes positive play, in a dedicated space. A great way to bond over an outdoor activity too, e.g. plant exploration. Encourages refined development of their gross and fine motor skills. We weren't joking when we said there are near endless activities with a Tuff Tray. 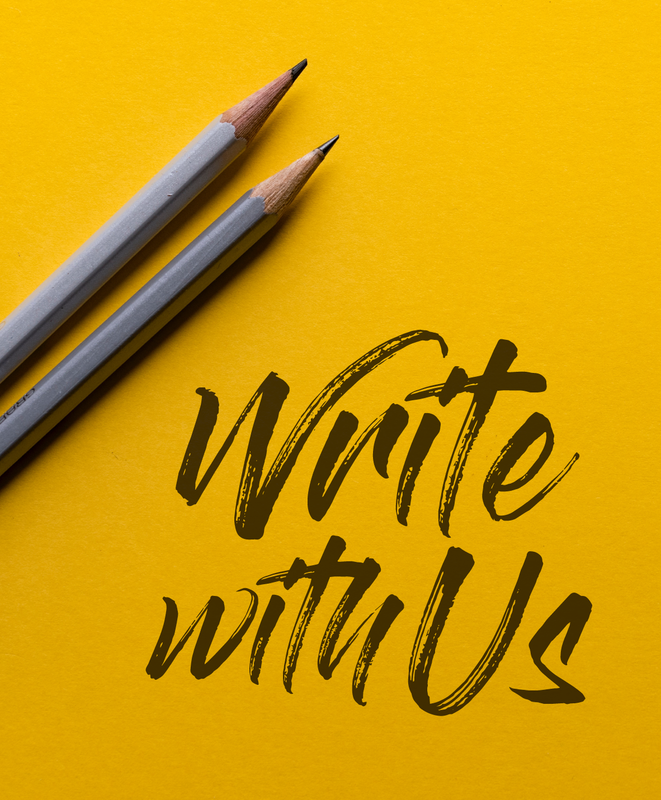 Here are 12 of our favourite ideas from parents across the community. Want more? Here's a piece on even more Tuff Tray ideas. This one from Early Years Careers uses different types of dry food and textures. 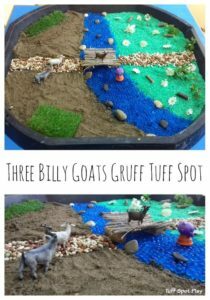 Why not create a farmyard scene with them? The different foods could represent the areas in which the animals live. 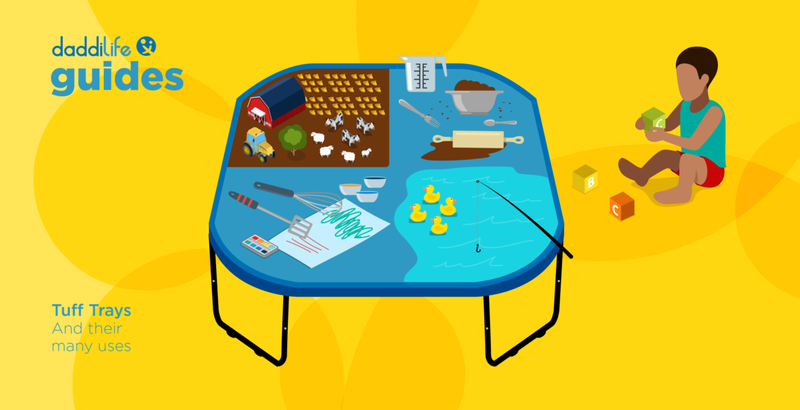 Include a farm building, animals and small world people to bring the imagination alive. What do you do with those vegetables that are near the end of use? 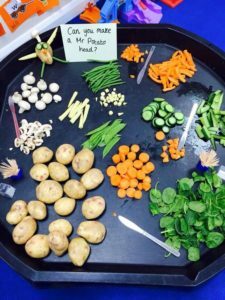 Why not gather them all onto the Tuff Tray and challenge the kids to make different shaped potato heads? Fill the Tuff Tray with water, and any rocks/stones that can resemble the seaside. Now gather your ducks and place a loop shaped object on their backs. Simply use a hook or stick to gather them up with the kids. There are loads of ways to do this. With leaves, just collect a few different ones from the ground and place them altogether. Or add a range of small, hard materials such as pulses, pasta and rice to the Tuff Spot and mix them together. Then offer some small sorting bowls and chunky tweezers, allowing the children to sort the materials into the bowls using the tweezers. 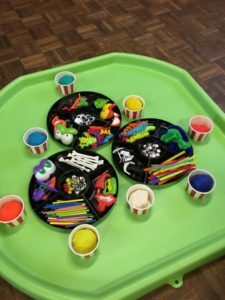 This activity will support children’s fine motor skills alongside their hand eye coordination. Do you ever feel you're lacking in space for all the PlayDoh to come out? If so, this one's for you. Gather all the PlayDoh pots and open them up along with a set of materials for the 'monster's' eyes, legs and arms. Then let the kids create the most scary and silly PlayDoh monsters! Add a bit of height to the Tuff Tray fun by putting a large / wide stick (something like a mini-tree branch) and place it into a pot or vase with soil or sand. 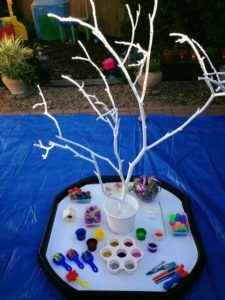 Add some pens, paints and buttons that can hook onto the tree to make it a truly Magic Tree. We love this one from Adventures and Play. Tuff Spots make the best Dens too! "We used a duvet cover. We don’t own any brown sheets to represent the soil so I used a green sheet to represent the grass. I realised that if I folded the duvet cover in half it fitted around most of the Tuff Spot Stand. I had three sections left which were uncovered. 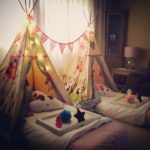 I used two pillow cases to cover two of the sections and one would be the entrance." This one again from Adventures and Play. To introduce the concept of gravity to a toddler I used balls purchased from PoundLand. I set our Tuff Spot Stand so that one side was high whilst the other sides were at their lowest setting. I placed two empty Pringle tins and a cardboard bottle bag inside the Tuff Spot. If your children are into drawing then this is perfect. Tape together a few pieces to paper into one huge canvass. 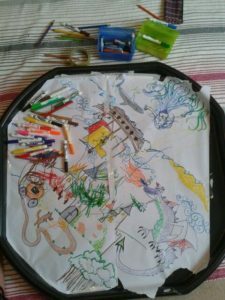 Then place the pens and colours in the centre of the Tuff Tray and let their imagination run wild. If you can get them to tell you the story as their drawing it, even better! This is a great idea for children that love building and creating structures. 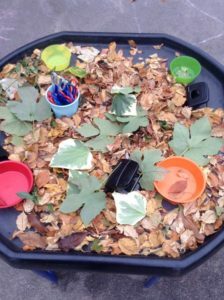 Add lots of different sized blocks and trees to the tray alongside some wet sand and spades. Allow the children to use the wet sand as cement to also create buildings and structures. 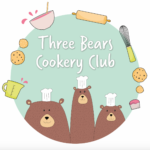 This will support the children’s creative development and their problem solving skills. Gather together your growing materials; soil, bucket, used toilet roll and any toy animals that want to join the fun. Get them planting seeds into the soil and think of the Tuff Tray as their growing station. Use different textures for the land and grass. We used wet sand for one side and dried foods for the other. Then use something blue like marbles or beads to represent the river. Make a pathway for the goats and sheppard those goats over the bridge! Make sure the stand is height adjustable: to be honest I thought the ability to adjust the height on the stand was so that the Tuff Tray could get taller as the child grew. Oh how wrong I was! As you'll see from the activities above, different Tuff Tray activities require the Tuff Spot to be at different heights. Don't leave it outside: Tuff Trays are great for outdoor play, but we wouldn't recommended that you leave the stand outside over night or in the rain. Store it in the shed or indoors. Make sure the plastic doesn't warp: The last thing you want to do is use the Tuff Spot 2-3 times before the plastic starts to fade. 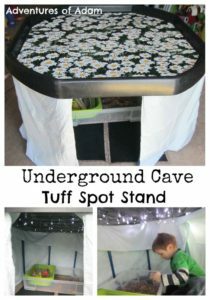 Make sure to get a strong and durable Tuff Spot. Kitchen roll / Wipes: Finally, always have some super strong kitchen roll just in case. Ama​​zon has a great selection, and you can also get all the separate parts for the future if there's any wear and tear. This one (pictured) from Crazy Gadget is a particularly strong and sturdy, but you will need to get a mat separately. Ebay also has a good selection of Tuff Trays, and if you're willing to shop/bid for the items separately, you can get an even better price overall. If you're looking for a good value all in one package, then this one from Shopping Sky World is particularly good and comes with all 3 parts at the best price and quality we've found so far. There are also a range of stockists across the country for you if you want to make the trip. Whatever you do, have fun. 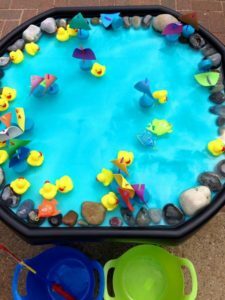 The Tuff Tray is so much more fun, practical and inventive than I ever thought possible, and I hope this little guide helps you have Tuff adventures all of your own too.